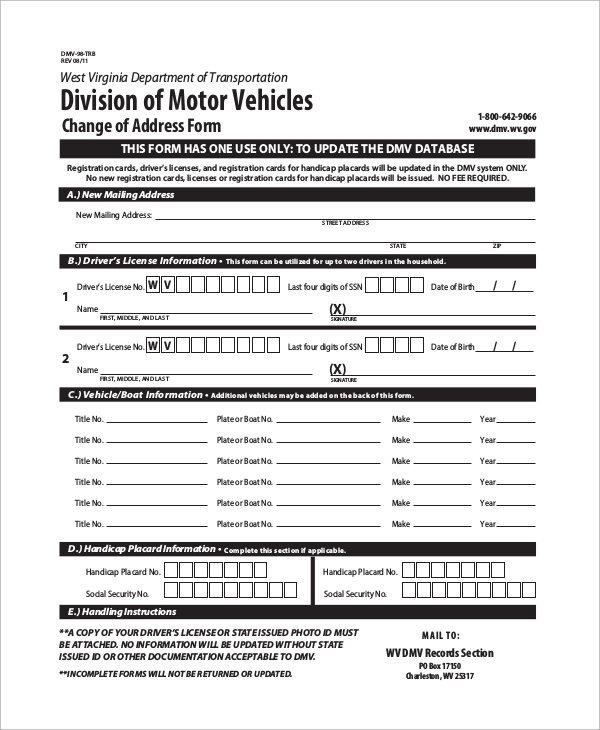 DMV change of address form is mandatory for all the drivers and car owners who want to change their address on their driving license, vehicle registration records, or any permit or ID card. This change of address is applicable for mailing address, residence address, and even parking addresses. There are different Sample Forms for changing various types of address, and all such forms are placed below to examine them and get all the data ready. This is a specific notice for DMV driver’s license change of address. 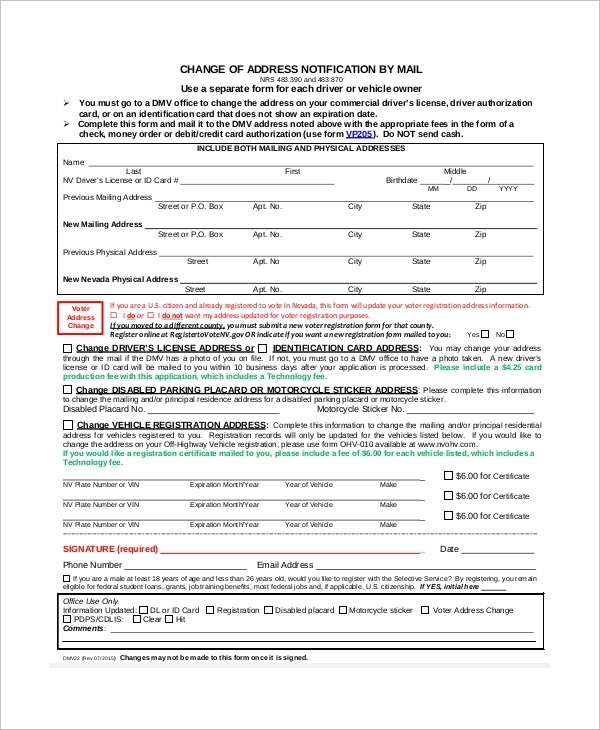 It is a 2-page form containing a new mailing address, license details, provision to change in parking placard, vehicle registration address, identification card address and other payment details. This is a complete CA DMV change of address form. 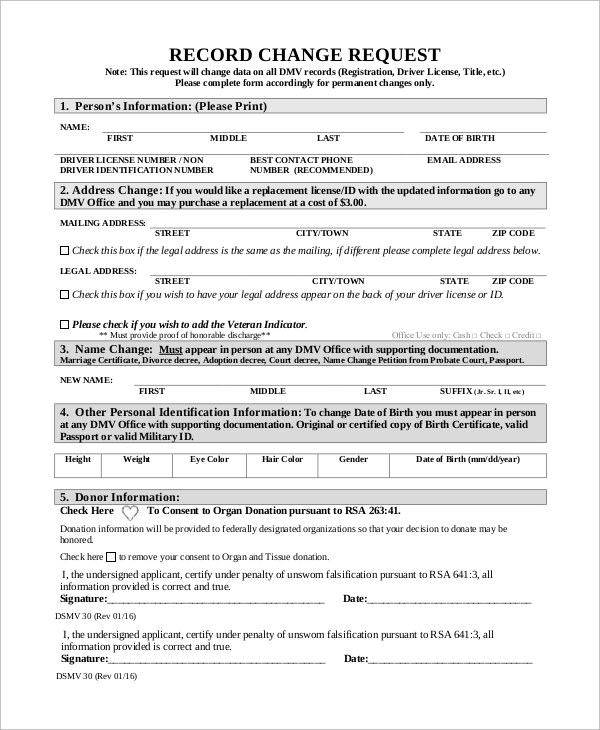 It is a two-page form with fields for new residence address, new mailing address, personal information and other necessary provisions and important declarations. This is a perfect notice form for DMV change of address. It contains provisions for writing personal information, new or correct residence address, mailing address, vehicles details, leased vehicles, the location of vessel or trailer coach. 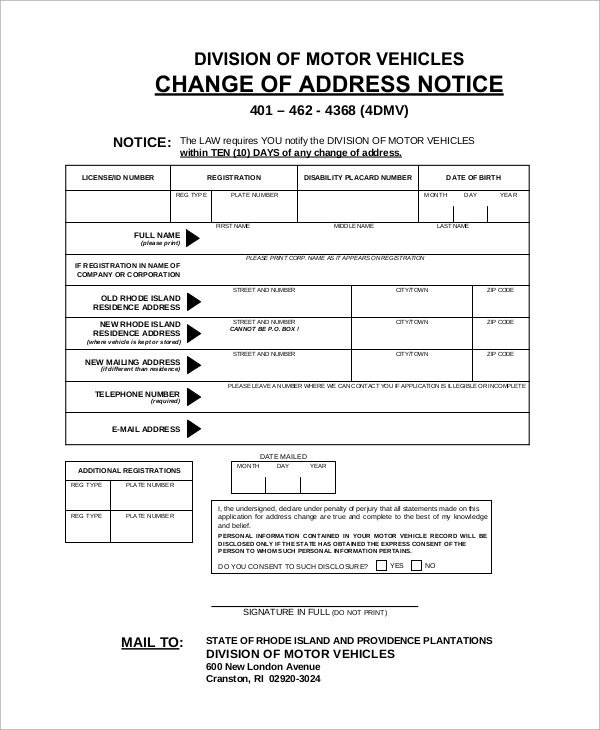 The DMV Change of Address Form Samples is useful when an owner of a vehicle wants to change the address that has been registered for residence address, mailing address or parking park for a particular vehicle. They are also for drivers to change their address on their driver’s license and any other permit card to make it updated and perfectly legal. DMV change of address forms contain all the fields, and one can look at them and understand the fields one needs to fill, the document one needs to have and other necessary instructions. 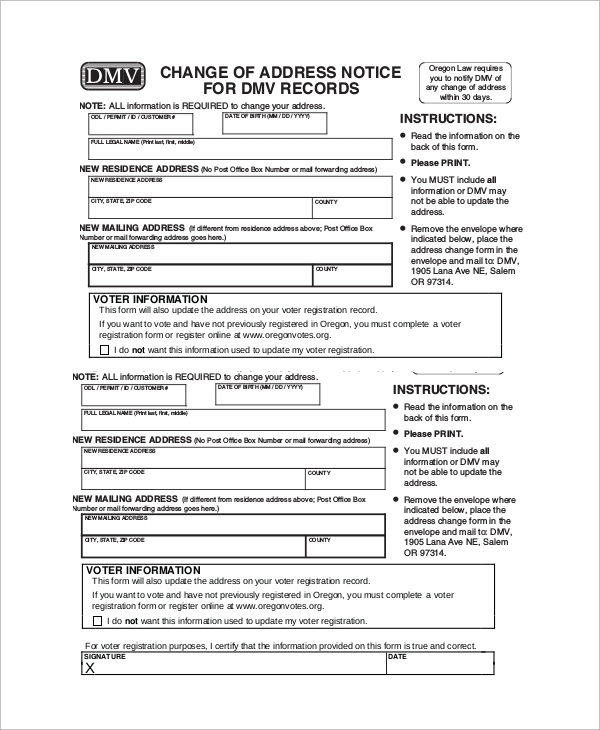 This CT DMV change of address form contains sections for individual address change and voter Registration Form. There are spaces for declarations, statements and other necessary information that DMV records need to hold. 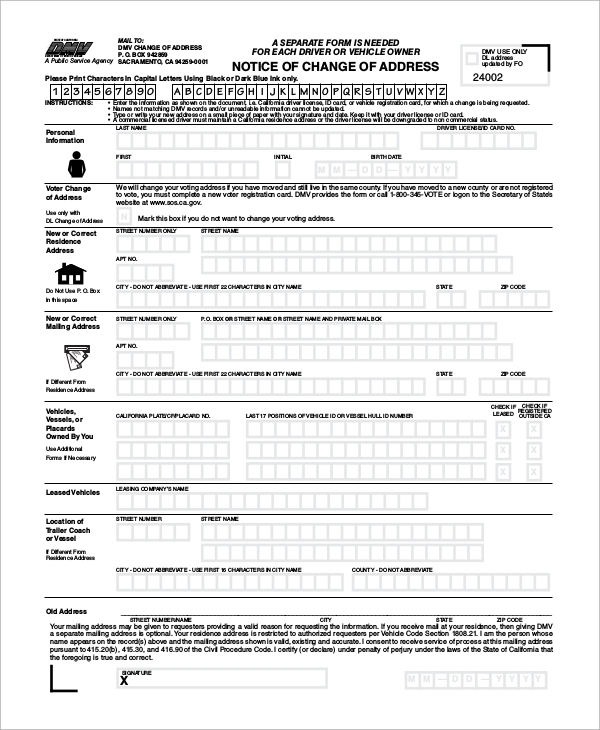 This is a complete NY DMV change of address form with proper explanation and instructions to update the address. There are fields for license card or ID card or any other cards, registration details, the section for replacement of document and voter registration application. The targeted audiences for the DMV change of address forms are the owners of different vehicles who want to change either residence or mailing address due to a shift in the resident house or for changing parking address. They are also applicable for drivers to change their address in driving and any other ID card. As a matter of fact, they are needed for common people to change address or other data in ID cards. 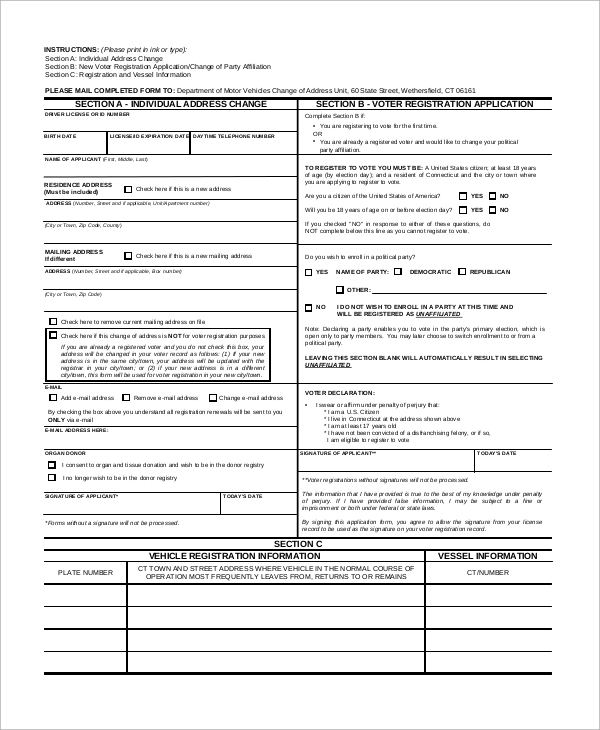 You can also see the Sample Social Security Forms. 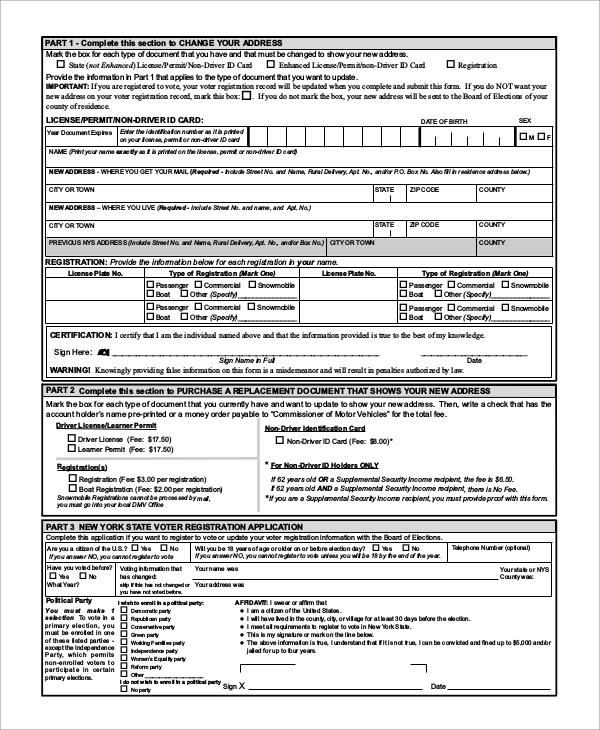 The above-listed DMV change of address application forms has different types of forms that cater to various types of change of addresses such as residence, mailing, parking address for a vehicle, driver license, ID card and much more. The forms will give a complete idea about the data one needs to have to apply for the change of address and the document one needs to submit for evidence. You can also see the Social Security Application Forms.